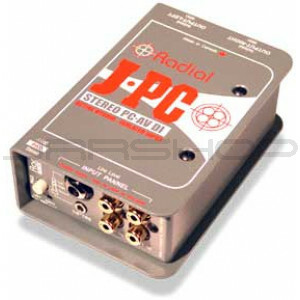 The Radial JPC is a stereo direct box that has been specifically designed for use with computer sound cards and other consumer electronic products to allow these to be connected to a professional sound system. It is unique in that it combines the advantages of transformer-isolated inputs with an active drive circuit, giving you the ‘best of both worlds’ in a compact and extremely flexible package. Transformer coupled inputs have the unique advantage of isolating the ‘source’ from the ‘destination’. This proven approach eliminates 60-cycle hum and buzz caused by so-called ground loops when two pieces of electrically powered devices are connected together. Because the active circuit does all of the impedance conversion and balancing, a dedicated 1:1 transformer can be used. This results in a hybrid design that is at once great sounding, compact and more affordable. As with all great designs, simplicity is a fundamental trait and the Radial JPC certainly fits the bill. A choice of stereo ¼”, 1/8” and RCA input AND thru-put connectors make interfacing a snap with all types of equipment. A single switch inserts a –10dB pad, two power LEDs confirm 48V phantom is turned on, and a pair of XLR output connectors round out the feature set. Of course like all Radial products, the JPC is built to handle any environment. The book-cover wrap-around sleeve design protects switches and connectors from damage while the 14 gauge steel I-beam construction eliminates stress that could torque the PC board and cause solder joint failure. A full-bottom no-slip pad provides electrical insulation and mechanical isolation with plenty of ‘stay-put’ for use on hectic stages. And with its baked enamel finish, the Radial JPC will continue looking great for years!